There is a connection between the private self and the public world that is charged with tension. Our tendency when moving within modern urban environments is to recoil from this energy, to turn inward and become willfully blind to the people, places, and objects around us. 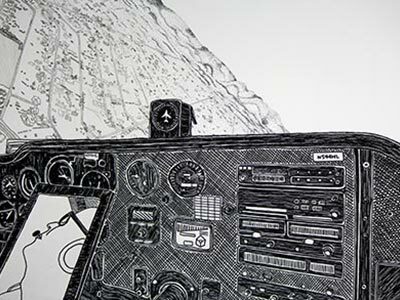 In this exhibit, artists Ned Axthelm and Rick Oginz turn their gaze outward, embrace their surroundings, and explore the rich dynamics, at once fragile and powerful, of the Bay Area. Join us for an evening of art, food and wine. 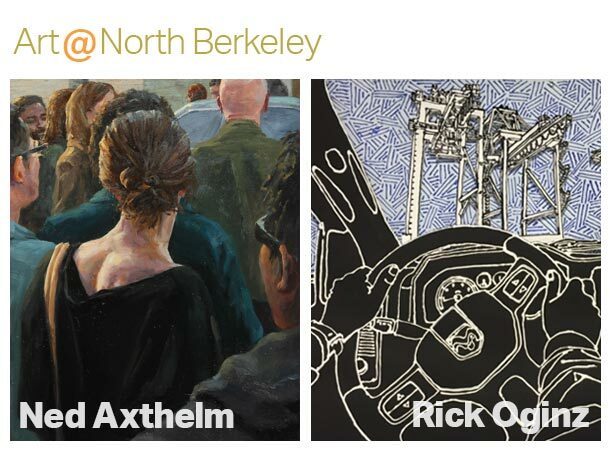 Meet the artists, explore their artwork and mingle with North Berkeley staff and friends. Ned Axthelm’s current paintings explore the private self that is brought into public and expose the unacknowledged power dynamics that exist between strangers. He chooses his subjects from strangers he encounters randomly and situations common to everyday urban living. 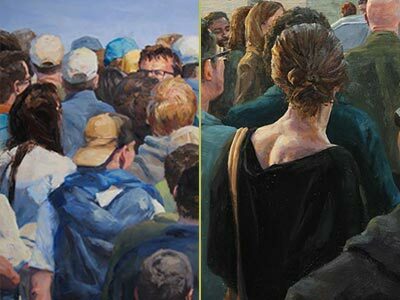 His paintings are devoted to the relationship between viewing and being viewed. 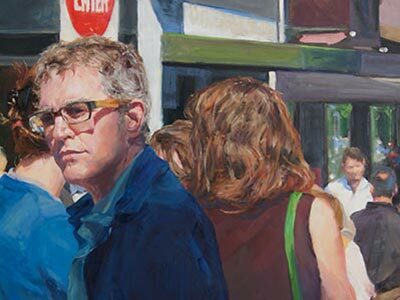 He earned his MFA at the Academy of Art University and paints the people of the San Francisco Bay area without their knowledge. Rick Oginz has been making sculpture and drawings for over 5 decades. Inspired by science, technology, and his immediate surroundings he explores the major events and innovations that are unique to our lifetimes. 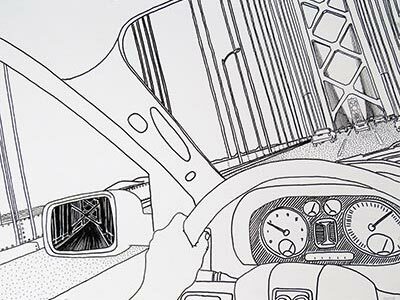 Oginz uses pop iconography and the commonplace objects to examine modern and timeless modalities of transportation, communication, and identity. Within the work there is a strong trend towards describing his immediate surroundings. Oginz currently resides in Oakland, California and several series of his current work reflect the life and industry of that region. His work is in the permanent collections of several major museums in the USA and Great Britain. We asked Ned and Rick a few questions about their art and what inspires them. Below are their answers. It's apparent that there is inpsiration everywhere and many stories to be unearthed. What is the inspiration for the subject matter of your work in this exhibit? And Can you tell us a story about how you found / discovered / captured one of your subjects? 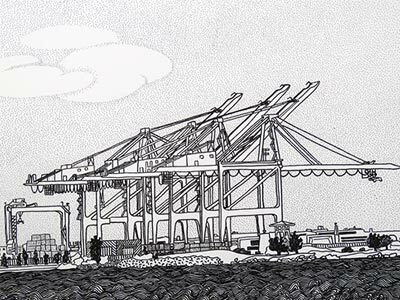 Most of the drawings in the exhibition refer to The Port of Oakland. They are done in the past three years which coincides with my arrival in the Bay Area. The manipulation of scale has been an ongoing feature of my work since 1968 when I first saw the Queen Elizabeth in New York Harbor. It's enormity was a marvel to me. Going up the gangplank was like entering a town. I was incredulous that this town could move but, once underway in the Atlantic Ocean the ship got smaller and smaller. On day 4 and 5 of the 7 day crossing we encountered a pretty big storm. Waves were breaking over A deck and the ship was dwarfed by the sea. Size is absolute but scale is relative. The most inspirational place is my studio. It's a place devoted to the expression of the imagination and anything can happen. What is the role of your art in your community? And should art be funded? My art is not complete till it becomes part of the community. I do love experiencing my own work but the point of making it is for others to experience it. Sales are a part of the artwork. The only way to support artists and what they make is to provide opportunity for the community to get to live with the art either in private or public space. What is the inspiration for the subject matter of your work in this exhibit? People. The people around me that I share this city with, who are living and working and feeling. I feel moments of empathy for others, experience these small moments for connection, and I am trying to unpack those moments. 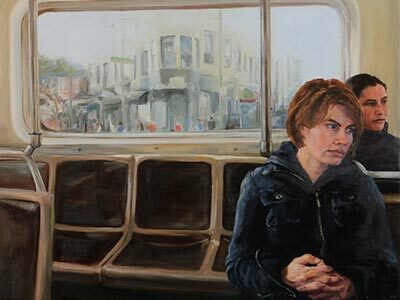 I want to better understand my own feelings towards strangers and I am trying to express these feelings of connection to the viewer. Can you tell us a quick story about how you found / discovered / captured one of your subjects? My process starts with taking photos. I take photos all the time. Whenever I feel a twinge of focus, when my attention is grabbed, I don't stop to question it but instead quickly take a photo. I then go back through my hundreds of photos and look for the ones that grab me again. It is at this point that I stop and question what it is about that moment that had meaning for me and how best to express it in a painting. So I take a lot of pictures of strangers. I am not covert about it, I try to be obvious in order to reduce the creepy factor, but even so I have only had one real confrontation, everyone else doesn't seem to mind. I was riding Bart into San Francisco, it was morning and folks were tired and there was this man on his way to work who had fallen asleep, head thrown back, mouth agape. It was a very peaceful pose and the challenge of capturing it was also very appealing so I took out my camera. It was a large SLR type so there was no question what I was doing when I pointed it at the passengers down the car. That was when a woman yelled, "You better not be taking my picture!" Her real phasing had more colorful language. A woman sitting two rows in front of the man had thought I was taking a picture of her. Looking at her I could see why she might think this was the case, she had her hair in a tall stack, colored with greens and pinks, and a pair of large goggles resting on her forehead, all rather eye catching and photographable. I put my camera down and apologized. So then I took out my drawing pad and continued to try to do my work. When she exited the train I again apologized, I showed her the drawings of the man, I explained that she was not the focus of my intentions but that I was sorry for making her commute uncomfortable. She huffed off the train. Other than that, other folks don't seem to mind if I take their picture. Debatablely, it may say more about where we live and the age we live in than their own thoughts about public photography. Public transportation has for a long time been an area of particular inspiration. It is a moment of quiet during a busy day. You see people in a different frame of mind as they travel from one place to another. Lately, though, I have been paying attention to crowds in public places. Crowds have an energy and focus that is very engaging. The flow and hustle, the silent compromises needed to navigate around and between each other, is all quite fascinating and beautiful. My intention is for my art to foster a greater sense of connection and caring between people. By pointing to moments of interaction that we all have with strangers in public and dwelling there, exploring the dynamics that flash by so quickly, I hope to draw attention to each other and create greater empathy. If nothing else I hope people pay better attention to the people around them on their commute! The funding of art is a complicated issue. It is very difficult to make art for a living and so the easy first answer is, "Yes, please! I am over here and would love some support!" The more complicated issues arise around the who funds and how. I think it needs to be a variety of sources (private, local, state, and federal government, and corporate) in order to ensure a freedom of expression and a diversity of type. That said, with the decrease in funding by government agencies over the past twenty years (down by around 30% once you take inflation into account) others need to step forward if it is something that you value. At the very least I would love to see pressure by the public on their government to fund school art programs and public art and art institutions so future appreciation and enjoyment are prioritized.